I’m not a gal who likes to fly by the seat of my pants at a gala. I prefer a high level of preparation so I can better adapt when something does go off script. One place I’ve made spontaneous changes has been in the Fund a Need. My preference is to set paddle raise gift levels in advance, but here’s one example where a spur of the moment change was warranted. Guests generously raised their hand to offer donations. As we moved through the levels, I found myself walking among the tables to personally acknowledge donors. When I reached the $250 level, nearly 20 people raised their hand to give. I then started to introduce the $100 level — and that’s when the commotion began. A few guests called my name and pointed to the other side of the room. 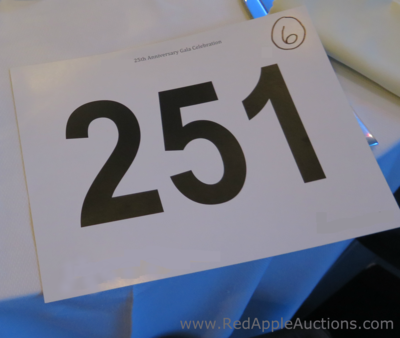 I turned to scan the room for bid numbers, wondering who I was missing. Were other guests wanting to donate? I didn’t see cards in the air. It took me a moment to realize guests were pointing DOWN. A young girl was winding her way around the tables. Not much taller than a seated adult, she was easy to miss. “I’m Sylvia. I saved $144 from my lemonade stand,” she said, and thrust an envelope into my hand. Sylvia was donating less than $250, but more than $100. She was presenting her gift at the most appropriate time in our Fund a Need activity — between the two stated levels of $250 and $100. On the fly, I created a level. Safely assuming that those 21 people were planning on donating $100 yet increased their amount to match Sylvia’s, her unusual paddle raise level raised an additional $924 ($44 X 21). For many reasons, it’s best to set your Fund a Need levels before starting the activity. Yet when opportunities present themselves, creating levels on the fly can be effective. What an inspiring story that gave me chills…the good kind! Yes! It’s fun when those surprises happen. I had that happen with a young man and his piggy bank. It contained $50.00 and just about everyone who had already donated at the other levels gave an additional $50.00. It’s times such as those that truly make a difference. Agreed — and great story, Rick!